There is nothing quite like being on call to photograph your very first birth story. Your camera bag has to be packed with gear, snacks, and a change of clothes. Batteries must be charged and memory cards cleared. Gas tank full at all times. And your schedule has to be more flexible than it's ever been because you might have to change your plans in an instant when your client calls to tell you she's in labor. For nearly two weeks leading up to delivery day, every single time my phone would beep, ring, light up, or buzz I would run across the room to check the screen. Even my husband started being hyper-aware of where my phone was at all times, handing it to me mid-sentence "because it might be your client!" even when it was just a Facebook notification popping up on the screen. And then on Saturday, February 25, I got a text message at 7:00 in the morning exactly 12 days before Danae's due date. Today was (probably...almost certainly...very likely...hopefully...) going to be the day! Danae and I stayed in touch all day long, checking in every couple of hours to see how her labor was progressing at home. 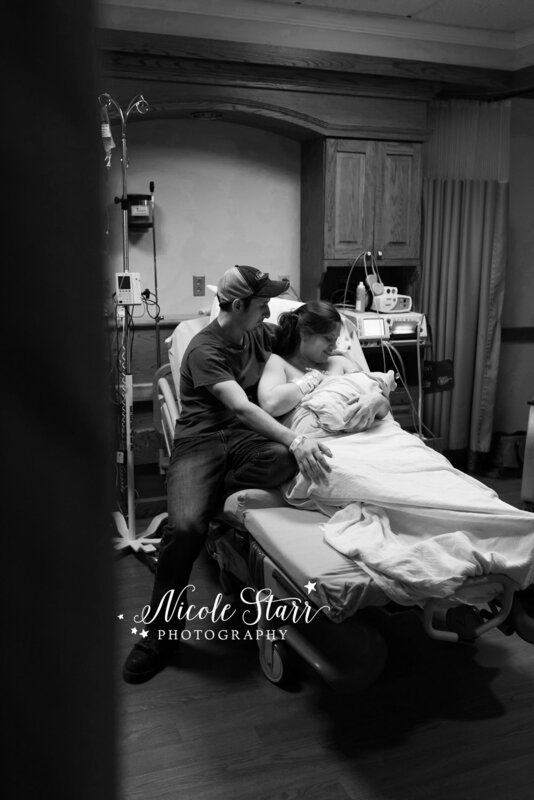 Since her contractions were only mild and not consistently spaced out, she and Cory chose to stay at home rather than head in to the hospital too early. As I later learned, they had a relaxed day of cleaning, organizing, spending time with their daughter, a haircut for the new dad, and a nice walk around the neighborhood before leaving for the hospital. Their little stroll did just the trick! Danae's water broke in the car on the way to the hospital, and they arrived to Bellevue Woman's Center just in time, a little after 8:30pm. When I arrived to the hospital at 8:54pm, Danae was completely in the zone moving through her contractions with the help of her husband, Cory, and her doula, Erica DeBie. Her nurse, Kelsey, was in and out of the room checking her stats and helping her get more comfortable. This wasn't going to be a long night, or a long labor. Danae's baby definitely didn't want to wait any longer to meet her mother, and within minutes Danae was pushing as the doctor rushed to put on her gloves and get the space ready for the baby's arrival. After only about a minute of pushing (thank goodness for the timestamp on my camera keeping track of just how quickly everything unfolded! ), Danae & Cory's little girl made her way into the world at 9:02pm, exactly 8 minutes after I stepped into the delivery room to photograph her birth. Danae & Cory were so excited to meet their second daughter, and they couldn't take their eyes off of their daughter. While the medical team moved in and out of the room, they were in their own little world with just the three of them, completely mesmerized by their brand new baby girl. 8 pounds, 6 ounces and 19 1/2 inches long. Marking her first footprints, listening to her first heartbeat, and hearing her very first cry. It truly was an incredible experience, and such an honor to witness this baby be brought into the world. Danae & Cory did an absolutely fabulous job together, and their daughter is perfect in every way. Thank you for trusting me to capture the beginning of your daughter's beautiful life for you!